What's You're Going to Die? Why You're Going to Die? While the event started strictly as an open mic, after having a special fundraiser event, where the format was changed to guarantee an audience and solid performers, I realized that I could amp up the quality of the show if I continued to curate half the evening with invited performers, all of which I could count on to bring talent and personal audience support. The first manifestation of the You're Going to Die movement, after & out of You're Going to Die: Poetry, Prose & Everything Goes, was You're Going to Die Presents, first occurring at the very start of 2013. You're Going to Die Presents is a place to proudly present great artists as they deserve to be presented: in the concert context of acknowledging their brilliant beaming mortal magic. Shows still steeped in the context of mortality, but showcasing individual openers & headliners with a dash of poetry or prose performed between acts to maintain the connection to the original event series. It came as no surprise that the first event would headline an artist that's supported You're Going to Die almost since its inception - Andrew Blair & his band We Became Owls. And the opener for the night was an artist featured once before at You're Going to Die: Poetry, Prose & Everything Goes... Tom Rhodes. Below artwork by Becky Redman. In the The YG2D Vimeo Group we, with the invaluable work of Max Silverman and Danny Baldonaldo, have a collection of over 250 videos of all the featured YG2D: Poetry, Prose & Everything Goes performers... Enrolling the help of three different videographers [so as to allow them each time off in a rotation of monthly shifts] I was able to organize regular posting to Vimeo group, as well as a "Best Of" spot reserved on the YG2D website for those outstanding performances deserving special recognition. These postings, or ultimately their online sharing, also helped to further publicize the event by including the website & event name in the closing credits of each upload. The You're Going to Die Publication Series came out of a want to showcase the writers involved in the live event series... I put a call out to artists to submit their writing for inclusion and enlisted the help of graphic designers to create all issue artwork. 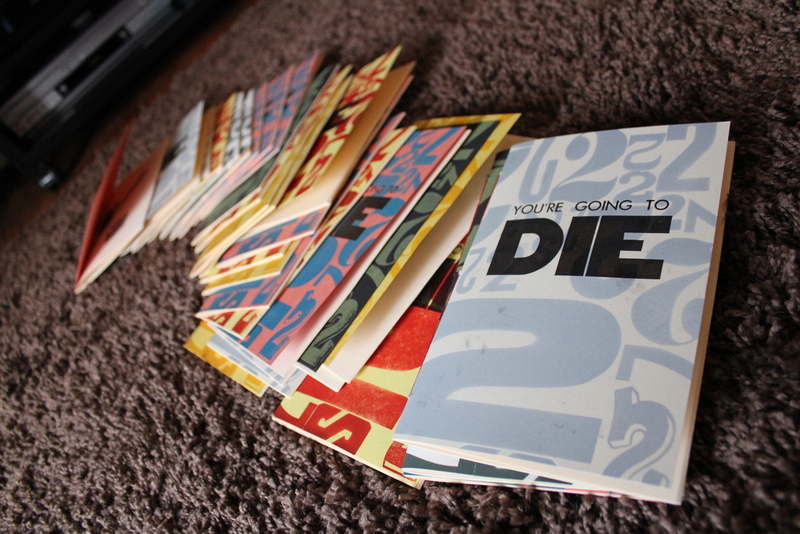 These publications were made available at every show for free or by donation, helping further fund the You're Going to Die movement as a whole. In much the same way as the publication, I put a call out to artists to submit tracks for inclusion and again enlisted the help of graphic designers to create all album artwork. The albums are made available for free or by donation on YG2D's Bandcamp Page. Album artwork by Becky Redman. Using funds raised from You're Going to Die events and donations, I designed YG2D's definitive online presence, compiling all versions of the movement to be accessible through one simple and easily navigable website. Writing for all manifestations of YG2D's online presence, with clear, digestible, catchy & moving messaging, containing inspiring, empowering, funny & poignant content, through The YG2D Facebook Page, The YG2D Facebook Group, The YG2D Twitter Profile, The YG2D Instagram Profile & YG2D's MailChimp Account, I was able to grow the movement beyond the live event, to a movement with over 15,000 followers... & counting.